Here's a cool idea: a blog which celebrates picture book biographies! It's hosted by Donna Bowman Bratton. You can read all about it here: http://www.birthdayographies.blogspot.com/. Thanks, Donna, for featuring my biography of Taylor Swift! And Happy Birthday, Taylor! I'm delighted to announce that my newest celebrity biographies were officially released yesterday. 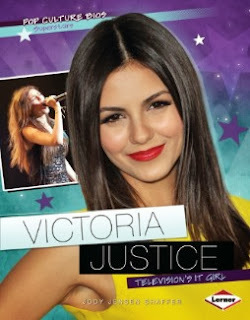 Please join me in welcoming DEMI LOVATO: TAKING ANOTHER CHANCE and VICTORIA JUSTICE: TELEVISION'S IT GIRL (Lerner Press, 2013). And guess what? 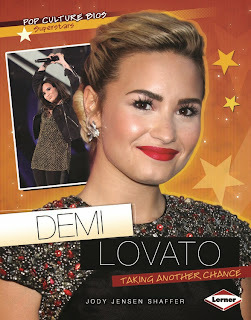 School Library Journal has already reviewed the series, which also includes books about Bella Thorne, Carly Rae Jepsen, Cody Simpson, and the band The Wanted! You can read their review below. "Gr 5-8--Along with high-appeal content, these celebrity biographies also offer high visual appeal with an engaging, colorful format and numerous photos. However, there is perhaps too much happening. Sidebars (which details the stars' favorite foods, movies, etc.) can distract from the texts, which are often choppy and too casual. Quotes from the actors/performers are scattered throughout, and full-color photos adorn almost every page (in addition to a final spread in each book devoted just to "pics"). The titles read more like teen magazines than biographies, but that might not be a problem if libraries have high demand for information about these particular stars." I sure had fun writing about these ladies. I hope you have fun reading about them! 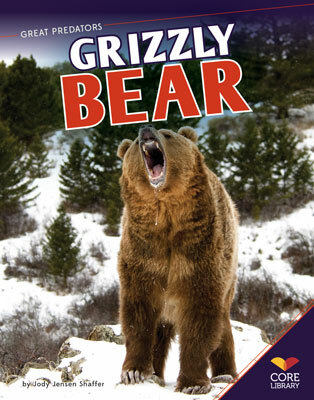 My latest book, GRIZZLY BEAR, is out with ABDO, and I wanted you to know. "Around the world, skilled animals hunt and catch their prey. Learn more about the grizzly bear and the special characteristics that make it such an excellent predator. This title takes you on the hunt with well-researched, clearly written informational text, primary sources with accompanying questions, charts, graphs, diagrams, timelines, and maps, multiple prompts, and more! Aligned to Common Core Standards and correlated to state standards. Core Library is an imprint of ABDO Publishing Company." 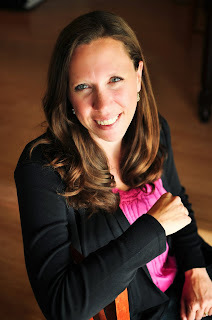 Today I'm hosting picture book author Brianna Caplan Sayres. Welcome, Brianna! DIGGERS is delightful! How did you find your publisher? I had signed up for a small group critique with a Random House editor to be held at the Jennifer De Chiarra literary agency. (Thanks so much to Jennifer De Chiarra and to Stacy Mozer for these awesome critique opportunities!) So I sent off two manuscripts. The morning of the critique, I got an email with the title of one of the manuscripts. Was the editor writing me for some reason? Then I read the email. It wasn't from the editor who was giving me the critique. It was from a wonderful agent I had submitted to via an online form a month or two earlier. The agent (now my wonderful agent) liked my manuscript and wondered if I had anything else. "Did I have anything else?!?!?!" Yes!!! So I went off to the critique in a very good mood. What a great day! Then the editor passed out the amazingly detailed written critiques she had prepared for each of us. She was so thoughtful. As I began to skim through mine, I was very pleased. She was very complimentary about my first manuscript and believed it would find an editor. Hooray! Then I read what she had to say about my manuscript. Again, she was very complimentary, but the final line really got me. She "would like to consider acquiring it for their list" Oh my!!! But that November day when I first heard from both my agent and my editor was incredible! My editor and I went through three or four rounds of revisions on DIGGERS. The first round was right after it was acquired. I completed the revisions that my editor had suggested on my manuscript in her initial critique. I removed some verses entirely and replaced them with others. Others I polished to make them flow better. Also, my editor suggested changing one of my verses to make it about monster trucks. Some parents and grandparents have mentioned how much their kids appreciate the inclusion of monster trucks, so this was another awesome suggestion! Finally, my editor came back to me with one more super-important question. I had not answered the question I posed in my title. Where DO diggers sleep at night? Yikes! How could I NOT answer that question? But, how COULD I answer that question? After some thought, I added two more verses that imagined where all the trucks could be sleeping... though I kept it in question form just like the rest of the manuscript. Working with my editor was wonderful! In each round of revision, she challenged me to make the manuscript better and better! Your second picture book, TIARA-SAURUS REX, sounds delightful! Can you tell us a bit about it, without giving away the plot? My agent nicely described it as "a tale of a very competitive dinosaur named Tina and some disappearing contestants at the Miss Dinosaur Pagaent." TIARA-SAURUS REX will be published by Bloomsbury in 2014. Can you tell us about the acquisitions process? About a month later I got a phone call from my awesome agent. We were going to get an offer! And then came the email with the offer! It was real! I've got a lot of other fun picture books in the works. A couple about dinosaurs, a couple about jazz, and one fun one about a dragon. Now that you're officially an author (woot! ), what is the most surprising thing about it? What's the most rewarding? I think the most surprising thing about officially being an author is how badly I keep wanting to get the next book published. Somehow in my dreams of being an author, I always imagined how wonderful it would be to get a book published. (Which it is! Yay!) But in my dreams, I almost imagined that as the end. But in real life, it is fantastic to get a book published.... and I can't wait to work on getting the next one out there (and hopefully the next one and the next one and the next one!). The most rewarding thing is hearing that kids enjoy my book. That it is being read every night or memorized or has become a favorite. That is an awesome feeling! I am also loving getting to do school and bookstore visits. I was a classroom teacher for many years and I love to teach writing. It is so much fun to get to be the visiting author who teaches kids about writing. Thanks for visiting with us today and telling us about your publishing journey, Brianna. Best of luck with the rest of the trip! You know how sometimes a situation presents itself, and you think, "I could help with that!"? "Well, I recently accepted a position as principal/curriculum coordinator at a local charter school here in Texas. We are a PK-8th grade campus with approximately 300 students. Over 90% are at poverty level. Our library is coming along slowly. We are in need of lower level AR books (PK-2nd grade for sure). Our library budget is nonexistent. We could use new or gently used books. If anyone knows of publishers/bookstores/individuals who might be willing to donate some books, I'd greatly appreciate it. We are the Ehrhart School in Beaumont, TX. Thanks so much! I thought about all those kids needing books for their library with no funding and with school just weeks away. I thought about the complimentary copies of my books just sitting at home in my office not being used. I contacted Larry and asked if he'd like some of my books. I knew they didn't meet the Accelerated Reader requirement he requested, so I wasn't sure. Larry responded with a big yes. I got the address of the school and boxed up my books. I happened to mention my exchange with Larry to a writer friend. She wanted to donate some of her books, too. That started the ball rolling. I contacted Larry, again, and asked if he'd be okay with me posting his message about his school's need for books on my blog. Maybe other authors and publishing folks would donate their books. Maybe they would re-post, re-blog, tweet, and message their friends. Maybe we could send lots and lots of books to Beaumont, not just my five. Thus, Books for Beaumont was created! Feel free to share this post. Let's fill the shelves of the Ehrhart School's library. School starts August 26, so don't delay! Thanks for helping with Books for Beaumont! They had an iguana, too, who was NOT, I repeat, NOT overweight. watching "Sweet Revenge," a hilarious melodrama staged by students of the University of Minnesota. It was performed on the Mississippi Centennial Showboat on Harriett Island in St. Paul. It was worth the trip by itself. Well, this and the rooster. I could go on, but I won't. We made lots of great memories. Thanks for being super hosts, Twin Cities! Friends, drop me a line and let me know what you did this summer for vacation! Brianna Caplan Sayres' Interview with 3 Highlights authors! 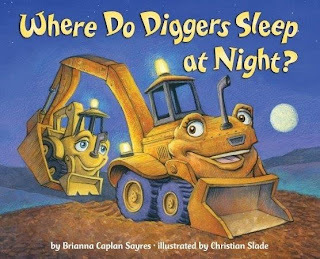 Picture book author, Brianna Caplan Sayres, (WHERE DO DIGGERS SLEEP AT NIGHT? and TIARA-SAURUS REX) interviewed three authors of Highlights pieces--one from each of their magazines, Highlights for Children, Highlights High Five, and Highlights Hello. I was lucky enough to be interviewed about my recent poem, "Robins' Treat," in the June issue of Hello. Check out this great review of LIAM posted by Booklist on June 1st. Woot! 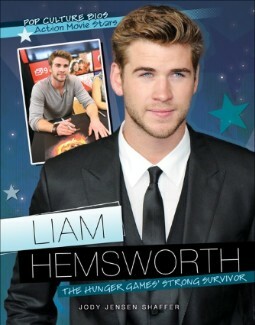 Liam Hemsworth: The Hunger Games' Strong Survivor. Mar 2013. 32 p. Lerner, library edition, $26.60. (9781467707428). Lerner, e-book, $19.95. (9781467710145). 791.4302.
glazed doughnuts at one time.” For drooling fans, additional resources are offered. 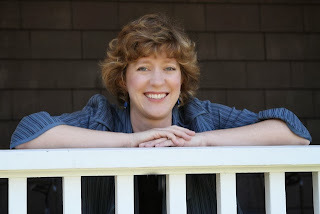 Casey McCormick, of the fabulous blog Literary Rambles, interviewed me today. It was really great to be her guest. Thanks, Casey! Stop by and give Casey a high five for me! 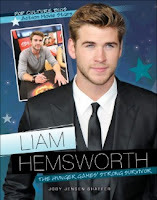 And enter to win a signed copy of LIAM HEMSWORTH: THE HUNGER GAMES' STRONG SURVIVOR! I'm pleased to announce that my latest books, LIAM HEMSWORTH: THE HUNGER GAMES' STRONG SURVIVOR and JOSH HUTCHERSON: THE HUNGER GAMES' HOT HERO, are out in paperback and library binding! • once dressed as a table tennis player for Halloween, complete with white "short shorts"? • couldn't stop laughing the first time he saw a squirrel—a type of animal they don't have in his home country of Australia? • is absolutely crazy about Vegemite, a veggie paste that Aussies spread on crackers? Want to know more about the life of this talented celebrity? Read on to learn all about Liam's early years, family, rise to fame, favorite pastimes, engagement to Miley Cyrus, and more!" • bakes an awesome apple pie? 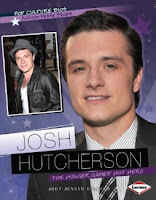 • joined forces with Hunger Games costar Liam Hemsworth to jokingly support “Team Haymitch”? • felt a deeper connection with the character of Peeta than with any other role he's played? Want to know more about the life of this talented celebrity? Read on to learn all about Josh's childhood, family, past projects, pet peeves, future plans, and more!" "This book [LIAM] would be an especially excellent pick for a reluctant reader--simple, fun text, engaging photographs, and lots of funny/cute sidebars. Liam Hemsworth is a rising star, so this biography would be a good purchase for libraries as it will be well-read over the years. Since it mentions the second and third Hunger Games films, this biography will not become outdated too quickly. Highly recommended purchase for most public library nonfiction collections." A huge THANKS to all who stopped by Barnes & Noble, Zona Rosa yesterday in the pouring rain to chat about books, vampires, and light. 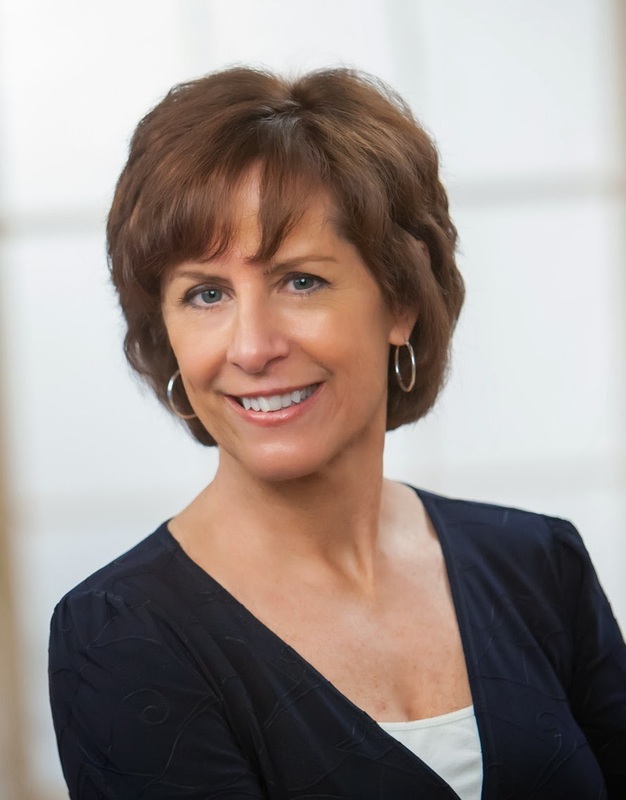 Another big YAHOO for Sherry Polito, B&N Community Relations Manager, for coordinating it all! Enjoy the pics! VAMPIRES AND LIGHT Book Signing--You're Invited! Sherry Polito, my super-fabulous Community Relations Manager at Barnes & Noble, is hosting me for a book signing, and you're invited! If you're in the Kansas City area on Saturday, March 9, 2013 at 1:00pm, please stop by and say hi. We can chat about books, light, vampires, or anything else. 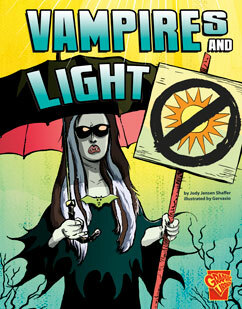 You might even score a set of neon-colored vampire teeth!